Could you describe, what you mean with this? I'm now 50m deep in to bronzies...still no card. BTW, I just got Light Bringer from Bronze Chest so I guess he should be included in the official list. 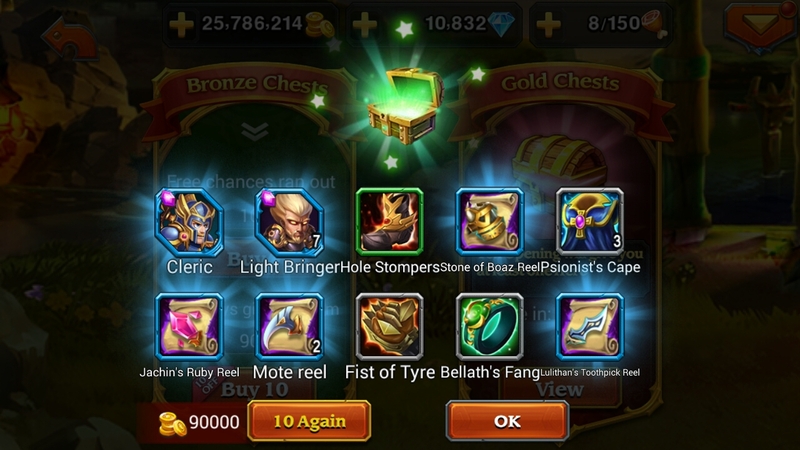 For a high vip where all bronze chest hero already *5. For spent 35 mil I got 2 full cards and 7 single cards on light bringer, but tusked stayed rarest one with only one card drop and no ss. Funny how RNG works. Spent 8 mil, got 2 TS cards but no LB card, just a couple of SS. Ember Blade isn't available from Bronze Chest. Pretty sure he is, I think I recall seeing him dropped. Will confirm in a few days when I open more chests. Yes, Light Bringer's full card is now avilable in bronze chest. Is there an updated list on this topic?